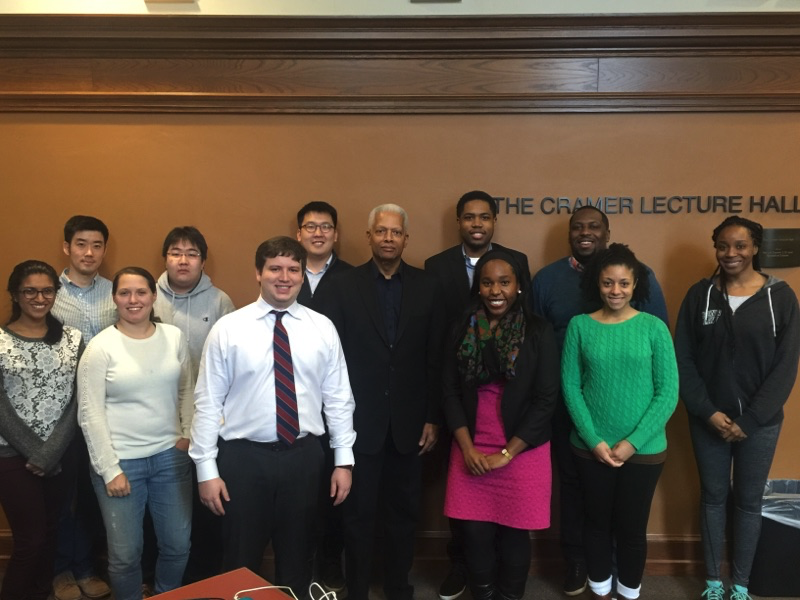 Congressman Hank Johnson for Georgia’s 4th congressional district visited the Journal of Law and Public Affairs on Friday, March 4th, 2016 to discuss how Lewis Powell’s memorandum to the US Chamber of Commerce influenced the rise of the mandatory arbitration clause in consumer contracts and how this negatively affected the consumer market in favor of the large corporations. Congressman Johnson started the discussion with an overview of Lewis Powell’s memorandum (“Powell memo”) to the US Chamber of Commerce in 1971. Generally, Powell memo is thought to have influenced many corporate activists and the Chamber to build a powerful array of institutions designed to shift public attitudes in favor of the free-enterprise capitalism against perceived socialist, communist, and fascist cultural trends—so called “the assault on the enterprise system.” Such institutions advocated for laissez faire economic policy and grew rapidly under Reagan administration’s “hands-off” business policy. Powell memo first asserted that the main sources of the attack are the media and the academic institutions. Powell further noted “One of the bewildering paradoxes of our time is the extent to which the enterprise system tolerates, if not participates in, its own destruction,” by funding these educational institutions and supporting the media enterprises that shape the public opinions about the corporate system in America. To this note, Congressman Johnson agreed that the corporations definitely interact with and influence the media and the educational institutions that shape the public attitudes; however, Congressman Johnson warned that this also meant that the corporations had the necessary tools and power to influence and mold the public sentiment toward an extreme free-enterprise capitalism on the other side of spectrum. Congressman Johnson noted that this tone of the memo, which significantly shifted the general economic policy toward the free enterprise system in America for decades to come, ultimately led to the rise of the mandatory arbitration clauses in most of the consumer contracts today. Congressman Johnson advocated against the enforcement of the arbitration clause for consumer products, because he believed that the mandatory arbitrations tipped the scale against the consumers by depriving the consumers of the 7th amendment right and forcing them to resolve the dispute, without choice, through an unfair arbitrator (often not a judge) in a corporation-friendly forum. Congressman Johnson noted that the mandatory arbitration clause in consumer contracts is a proof of the unchecked expansion of the corporate power in America. Congressman Johnson concluded the discussion by urging a balanced reform on a congressional level that both protects consumers’ interest and encourages the free-enterprise capitalism in a responsible manner. 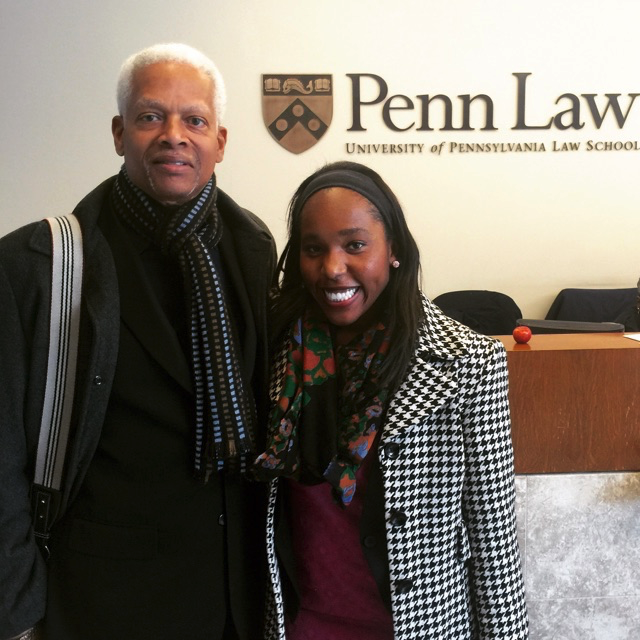 The Journal of Law and Public Affairs had the esteemed pleasure of hosting Congressman Hank Johnson from the Fourth District of the United States House of Representatives. 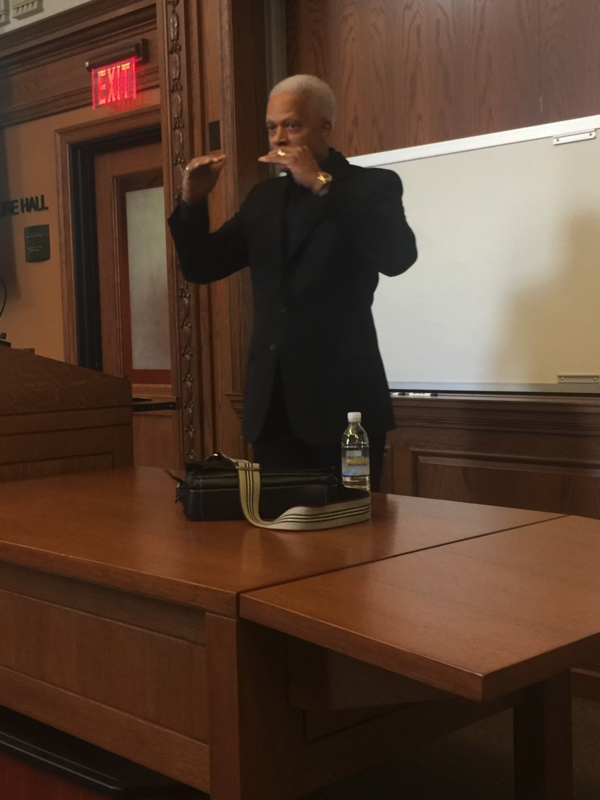 Congressman Johnson focused his conversation on the role of the Powell Memo in setting the stage for a contemporary justice system wedded to mandatory arbitration. The Powell Memo was written by Justice Lewis Powell in August 1971 to Eugene Sydnor, then Director of the U.S. Chamber of Commerce, two months before his confirmation to the Supreme Court. The Powell Memo called for corporate America to become more aggressive in shaping politics and laws that protected the free market system. Congressman Johnson discussed the Powell memo to argue that it sparked the formation of right-wing think tanks and lobbying organizations that led to legalizing mandatory arbitration clauses. 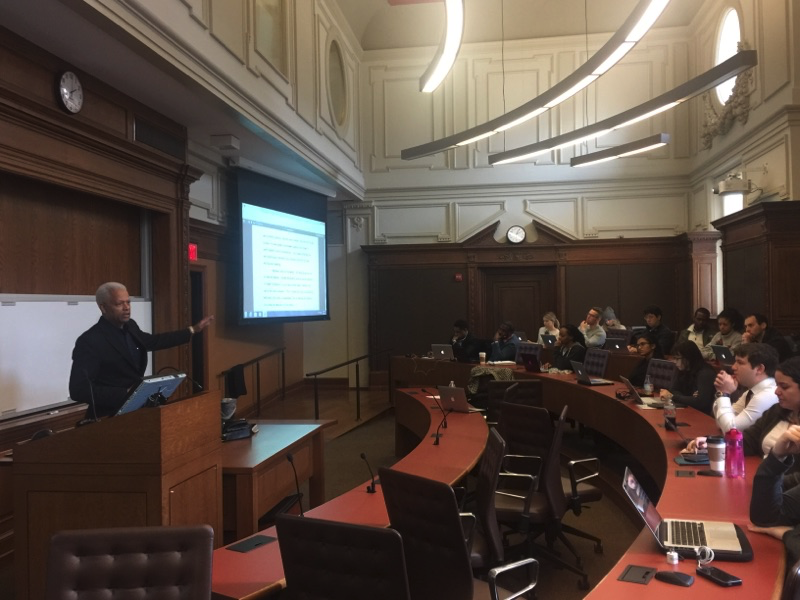 His discussion undoubtedly concluded that the Powell memo spurred a period of corporation friendly judicial activism that led to the promotion of mandatory arbitration clauses. He surmised that these clauses benefit business interests at the expense of consumers and must be overcome with legislation eliminating them in employment, consumer contracts, civil rights, and antitrust contexts. To this end, he emphasized a piece of legislation – the Arbitration Fairness Act – that he was working on that would achieve these ends. While Congressman Johnson’s argument may seem convincing on its face, it suffers from two major flaws. First, the argument unfairly hinges the development of consumer friendly laws on the Powell memo. This is problematic for several reasons, not least of which being that the memo itself did not have the conservative revolution it was intended to have. There is no right-wing literature that indicates that the Powell memo was some of catalyst for business owners and traditionalists to revert back to a full free market system. Outside of a loose connection to the founding of the Heritage Foundation, there is no evidence that the memo was fully read, much less followed, by influential conservative and right wing thinkers of the time. Further, the Powell memo focused almost unilaterally on the Chamber of Commerce in contravening what Justice Powell feared was a leftist attempt to disrupt the free market system. Upon reflection of the Goldwater/Reagan/Gingrich challenge to democratic power, the Chamber of Commerce itself never played any significant role in its scheme to restore political power to corporate interests. The Chamber itself wasn’t even closely allied with the conservative movement until the mid-1990s, and that only occurred after being forced to respond to the aggressive politics of labor-aligned interest groups. It stands to reason then that the Powell memo did not spur the creation of mandatory arbitration clauses. While there may exist valid critiques for these clauses as being overly pro-corporate, we cannot adequately pinpoint the Powell memo as the launching pad that created them. On this basis, Congressman Johnson’s reliance on the memo fails. While the memo may have been influential in some respects, especially with respect to the rise of right wing, conservative lobbying groups, this influence is minimal at best. In addition to Congressman Johnson’s dangerous conclusory reliance on the Powell memo to frame his argument, he also does not recognize any benefits to a mandatory arbitration scheme. For instance, arbitration is substantially cheaper than litigation. Although arbitration can cost more than $3,000, it still is usually far less expensive than going through litigation. Relatedly, arbitration is usually quicker than litigation. Arbitration proceedings also benefit from simplified rules of evidence and procedure. Arbitration also forgoes the complicated discovery process accompanying legislation which allows it to be more easily adapted to the needs of those involved. Therefore, while Congressman Johnson is entitled to express frustration with mandatory arbitration clauses, it is unfair to place the rise of such clauses at the feet of the Powell memo. Doing so ignores the relatively insignificant role that the Powell memo has had on the conservative movement and rewrites history. Further, such a view shortchanges the role arbitration plays in judicial efficacy and efficient problem resolution. I was immediately taken with Congressman Johnson, a U.S. representative from Georgia’s 4th Congressional district, especially after learning that the Congressman is one of two practicing Buddhist within Congress. After a brief introduction, the Congressman took us to his point of discussion: the Powell Memo. Louis Powell was a former Supreme Court Justice. His confidential memo of discussion, written approximately three-four months prior to his Supreme Court nomination by President Nixon, was written to his friends at the US Chamber of Commerce as an attack on the American free enterprise system. The Powell memo called for corporate America to become more aggressive in molding politics and law in the United States. The Congressman gave us some background as to the political climate at the time of Powell writing this memo. The historical and political background surrounding this memo include the 1960’s Civil Rights Movement and the Vietnam War. The political environment of the United States integrates public protest and lobbying. The Powell memo encourages powerful private institutions to partake in this “modern” political practice of lobbying for institutional change. The Congressman gave us an example of Ralph Nader using tort laws to hold corporations accountable for producing shoddy consumer products or even poisoning a food supply with chemicals. Essentially, it appears as though the regulatory powers of Washington had expanded to a degree which lead some in the business world to feel as though they were under attack. Thereby, Powell called for political mobilization to combat politics. Powell wrote: “Business must learn the lesson…. That political power is necessary; that such power must be assiduously cultivated; and that when necessary, it must be used aggressively and with determination- without embarrassment and without reluctance which ahs been so characteristic of American business.” Powell’s memo did encourage the politicalization of business. Due to Powell’s words or not, the number of corporate PACs increased from under 300 in 1976 to 1,200 by the mid-1980’s. The question today would be is the blended nature of private business and public affairs something to be encouraged or cautioned? I see the point of Powell’s memo to a degree. The regulation the federal government placed upon business in the 60’s and 70’s came without precedent. Beforehand, businesses were free to operate without much due government influence outside of taxation. Private actors should be able to lobby for their rights. However, the private actors with the resources to lobby are those able to lobby most efficiently. The question of fairness and equal representation comes to fruition when it is mainly large corporations putting out lobbyists and funds into Washington. Is the public good being met when private actors engage so intimately with policy-making? Is there anyway this could be changed? These were the questions I was left with after listening to Congressman Johnson speak to us.